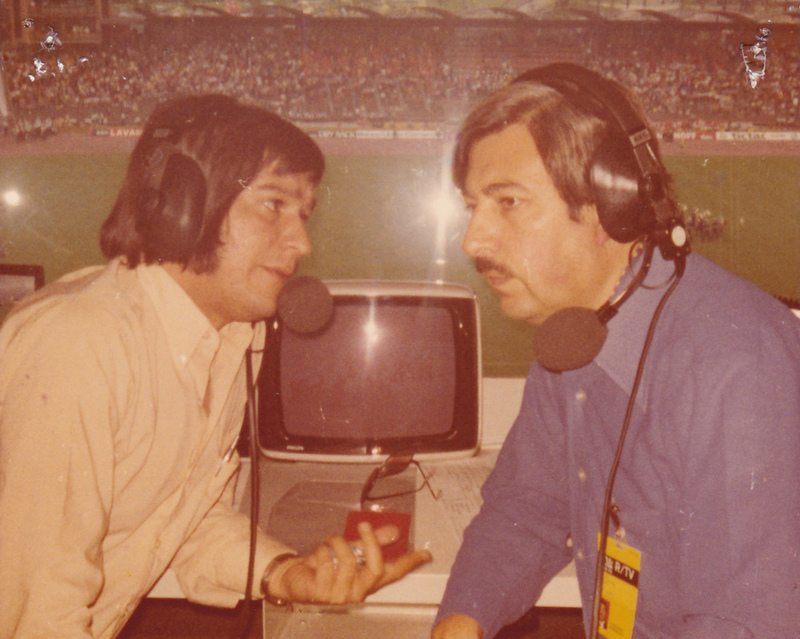 "I WAS SUPPOSED TO STAY FOR A MONTH, I STAYED FOR 21 YEARS"
For many Latin Americans over thirty, the Bundesliga will always have a particular voice - that of Colombian broadcaster Andrés Salcedo, who provided the Spanish play-by-play commentary of the German first division between the mid-seventies and early nineties. His entertaining style, which incorporated notes about German culture and whimsical nicknames won him many fans in the era that preceded the globalization of broadcast rights. Back in the warmth of the Colombian Caribbean, Salcedo now devotes his time to crafting novels. One is already published and uses the story of Brazilian striker Heleno de Freitas and his unsuccessful spell with Colombian club Junior de Barranquilla during the fifties as its heart*. With the Bundesliga enjoying boom times once more, I reached out to Salcedo to remember his experience broadcasting German football in the seventies and eighties, and to get his thoughts on the current Bundesliga landscape. Juan Mesa: How did you get the gig to broadcast Bundesliga? Andrés Salcedo: I was living in Madrid, working for Cadena Ser. We made a drama series that Cadena Ser sold to other International stations such as Deutsche Welle (DW), Radio France International, BBC, Voice of America and Sveriges Radio. In one of the episodes I created a German character and it was very successful. One day, to my surprise, DW called me to cover the vacation of a Venezuelan man that served as their Spanish announcer. I was supposed to stay for a month, but time passed and instead of going back to Madrid I ended up staying for 21 years. I got there in 1969 and when the 1974 World Cup came up I was assigned to do some features for the Spanish broadcast that was led by two great Chileans: Patricio Bañados and Sergio Silva Acuña. They were fantastic journalists. At that time, I have not a single clue about how to broadcast a game. Back in Colombia I was the commercial voice during breaks in games commentated on by a legendary broadcaster named Carlos Arturo Rueda, but never had the chance to call things play-by-play. After the 1974 World Cup, Cologne based network Transtel Deutsche Welle bought the Bundesliga broadcasting rights and began to look for a Spanish broadcaster that wasn't Argentine, Mexican or Spanish. They were looking for someone with a neutral accent, but weren't able to find it. They were giving up on the search when I asked for a tryout. I did what I learned from watching the Chileans - they were classy and never shouted any nonsense. I wasn’t optimistic about my trial and saw myself as a clown. However, a month later, they offered me the job after some focus groups in Mexico liked my voice. I didn't have much experience and to cover my faults I incorporated comments about wine, food and German culture, as well as trying to emulate German broadcasters who were fun because they put a sense of humour into their work. I then broadcasted the Bundesliga for almost 20 years. German football was in a boom at that time, right? Yes. They were in vogue since 1966 when they reached that infamous World Cup final against England. They were good at Mexico '70 and then won the Euros in 1972. The clubs also began to win in Europe as well. My job began after the World Cup and broadcasting rights per game cost around 100 dollars. There was no satellite, so every Saturday an English, French, and Arab man and I got into different booths and broadcast the games in our native language. The recordings were reduced to 53 minutes and sent to the Americas on Sunday via Lufthansa. They showed the games on Mondays in Chile, but some countries did it a week after the game. It did not matter, German football was a success in Latin America and the next thing for me was to narrate the competition show Telematch, which was very popular as well. How different is German football today? Many things have change but one thing hasn't, and it is the key to German success in football. It is how the clubs deal with their finances, you don't see the wasteful exhibitionism of Spain, Italy and England. They invest in youth systems instead of giving 90 million to some dude. They have a wise austerity and I believe their approach wins at the end of the day. The clubs are healthy financially and produce great players. People are packing the stadiums and clubs are winning in Europe. Of course, the style has changed, if South Americans got more athletic, Germans are more technical now. They have nothing to envy about Brazilians on how to control the ball, specially because there is no time for tricks in today's football. During the German reunification period, the West needed to invest a lot and football felt that effort. That is one of the reasons German football kind of lost a decade between the 1990s and 2000s. I also agree with Franz Beckenbauer when he states that football disappeared from the streets and that affected the emergence of new stars. True. It is like going back to the 20s and 30s when German stars in the Ruhr region were of Polish descent like Ernst Kuzorra and Fritz Szepan. In the 70s was Jurgen Grabowski. Then came the big immigration of Spaniards, Italians and Turks. The latter have enriched German culture on so many levels nowadays. Any Latin Americans in Bundesliga during your time there? Yes, of course. There was Argentine Carlos Babbington who played in second division for SG Wattenscheid 09. Many Bundesliga teams wanted him but he was attached to a contract and couldn't play in the first tier. There was Peruvian Julio Baylon in Cologne as well as Horacio "Tanque" Neumman, who came from Chacarita Juniors. He was a great guy, who used to play with us in his free time. In my time in Cologne, of 10 Latin Americans 8 were Peruvians. I do believe there is an admiring gaze towards Germany in Perú. Many people send their kids to their Universities as well. There was no Internet, how did you communicate with the audience? There were hundreds of letters and invitations. Because of the success of German football I was invited to Costa Rica Cycling Tour even when I knew little about the sport. I also went to Perú, Paraguay, Chile, and people were very welcoming. It was in Colombia where I was less popular because another guy got the tapes and voiced-over my broadcast. You were known for the nicknames you gave to players, is that a little of the Colombian way of doing things? Part of it, but also German names are hard to pronounce for Latin Americans so I came with nicknames to make it easier like "Migajita (Little Crumb) Littbarski or ”La podadora (The Mower)” Frontzeck. You know in Latin America you have a name in the papers and another one in the real world, the latter is the one that counts. Can you give me your Best XI from those years? Sepp Maier; Manfred Kaltz, Beckenbauer, Schwarzenbeck, Breitner; Günter Netzer, Jupp Heynckes, Overath and Franz Roth; on top I will put the Danish duo from Borussia Mönchengladbach - Allan Simonsen and Henning Jensen. Ok, put him on, he was phenomenal. Are you a fan of FC Koln? I disliked them. They were too regionalist for me. Overath was the leader and decided many things. When Argentine Neumann came, it was war against him even when he was of German descent. He later suffered a car accident in a trip to Bonn and his face was disfigured. My team was Borussia Dortmund, and I'm beginning to believe I was bad luck for them because once I left they began to win. How do you see Germany doing at the World Cup in Brazil? I think they're a candidate to win. I believe Spain is entering a diminishing period, although they're up there with the favourites along with Brazil, but Germany have a strong mindset. I believe so because in 1974 the Netherlands were superior and lost against them. German mythology is full of warriors like Siegfried and I think players bring that to the field. Juan Mesa is the editor of the blog ManzanaPecosa.com. Originally from Colombia, he's now based in New York City.